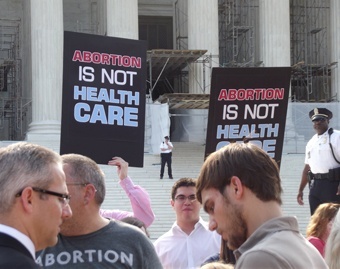 WASHINGTON, D.C., January 17 (CNA/EWTN News)—The Supreme Court will rule this year on a case involving “buffer zones” outside abortion clinics, but it has declined to hear a case on state abortion bans after 20 weeks of pregnancy. On January 15 the court heard oral arguments in McCullen v. Coakley, a case challenging a Massachusetts state law requiring a 35-foot buffer zone around abortion clinics, in which protestors and pro-life counselors may not enter to speak with patients. Supporters of the law say it is a matter of safety and unobstructed access to clinics, whereas opponents argue that it infringes upon freedom of speech and unfairly targets those who hold pro-life viewpoints. The Supreme Court is expected to issue a ruling in the case in June. However, pro-life challengers to the law say that it infringes upon their constitutionally protected First Amendment right to the freedom of speech. They have argued in a legal brief that the law “indiscriminately criminalizes even peaceful, consensual, non-obstructive conversation and leafleting” and that it unfairly targets certain kinds of speech, namely, pro-life counseling and views. Pro-life organizers from around the country have questioned the ruling. “Though the Massachusetts law in question certainly has to do with abortion, and the risk to thousands of innocent human lives is severe, this is a First Amendment issue first and foremost,” said Lila Rose, president of the pro-life investigative organization Live Action, in a January 14 statement. “Massachusetts is grasping at straws and its ‘bubble zone’ law flies in the face of the very notion of freedom of speech,” she said. The oral arguments in the Massachusetts case were heard two days after the Supreme Court announced that it would not be hearing an appeal from the state of Arizona that seeks to re-instate its law barring most late-term abortions. Enacted in April 2012, the Arizona law prohibited most abortions after 20 weeks of gestation. About a dozen other states have similar restrictions. Several other states ban abortion at 24 weeks, the point of fetal viability. Advocates of the Arizona law point to evidence that unborn babies can feel pain at 20 weeks of development and argue that late-term abortions pose a greater risk to the mother. In May 2013 a panel of judges from the Ninth Circuit of the United States Court of Appeals ruled the law unconstitutional, saying that Arizona’s limits on late-term abortion violated previous Supreme Court rulings that expanded access to abortion, including the landmark 1973 Roe v. Wade case. The Supreme Court declined to hear the case, offering no comments on its decision. This allows the ruling from the appeals court to stand, overturning the regulation. Other state laws will not be affected.